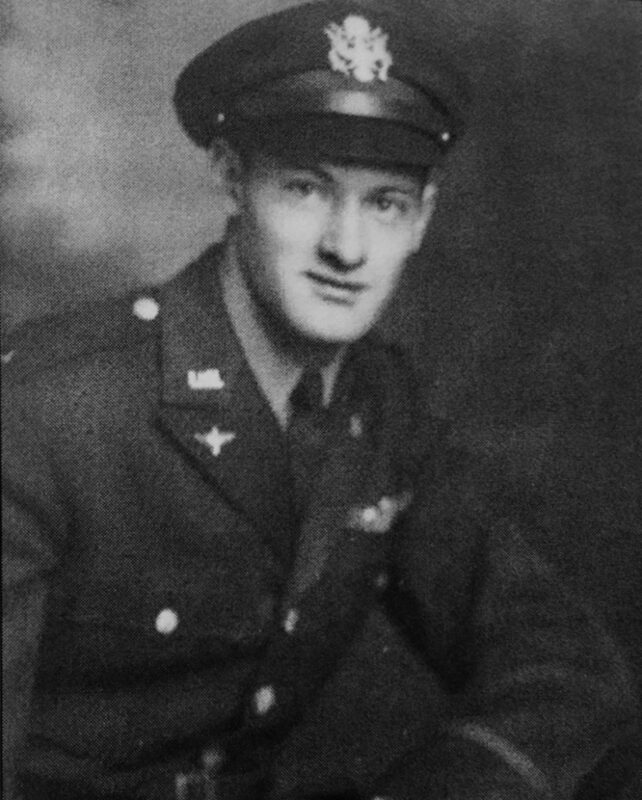 On August 30, 1943, Clayton A. Nattier was commissioned a 2nd Lieutenant in the United States Army Air Corps. He was 20 years old. Clayton A. Nattier B-17 Flying Fortress crew, Sioux City Army Air Base, Iowa, 1944. Kneeling left to right: Sergeant Ernest Lussier (Waist Gunner)*, Sergeant Max Kimmel (Waist Gunner), Sergeant Cecil Richardson (Ball Turret Gunner), Sergeant Richard Edwards (Tail Gunner). Standing left to right: Sergeant Eugene Blaskoski (Flight Engineer/Top Turret Gunner)**, 2nd Lieutenant Bernard Weinstein (Navigator), 2nd Lieutenant Clayton Nattier (Pilot), 2nd Lieutenant Gerald Johnson (Co-Pilot), 2nd Lieutenant William Gregory (Bombardier), Staff Sergeant Edwin Block (Radio Operator). *Sergeant Lussier completed his combat tour flying with another crew when crew size was changed from 10 to 9 members. **Sergeant Blaskoski was injured in England and replaced by Sergeant Gerald Bump. The Clayton A. Nattier B-17 Flying Fortress crew arrived in England in July 1944. They were assigned to the 306th Bombardment Group (BG), 369th Bomb Squadron, based at Thurleigh. The 306th BG target for the day was Merseburg, Germany. The IG Farben Leuna works, the second largest synthetic oil refinery in Germany, was located there. It was also the most heavily defended industrial target in Europe protected by the Luftwaffe 14th Flak Division. Composition of the division in October 1944 totaled 62,550 persons. 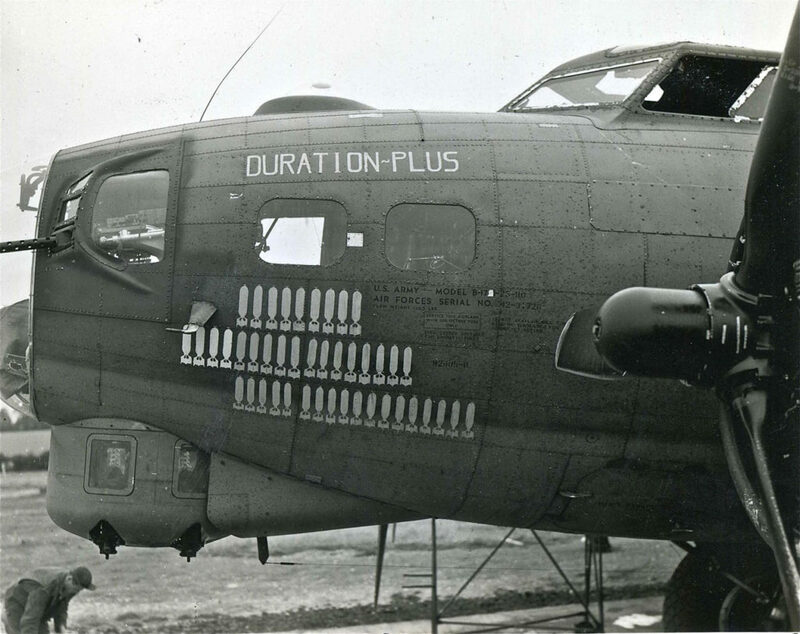 Duration Plus (a B-17 borrowed from the 306th BG, 367th Bomb Squadron, that day) replaced the Nattier crew B-17 when it experienced hydraulic brake problems as it taxied for take off from Thurleigh. After shrapnel hit the plane near the bombing target over Germany fire burst into the cockpit on the co-pilot’s side. The Nattier B-17 Heavenly Body was taxiing for take off when the plane developed hydraulic brake failure. 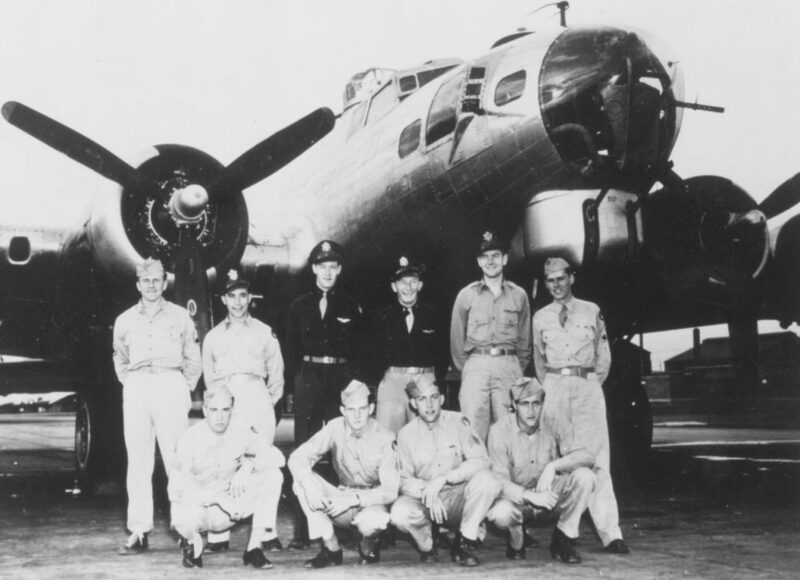 The B-17 Duration Plus assigned to the 306th BG, 367th Bomb Squadron, replaced it. By the time the Nattier crew took off that day their first challenge was to catch up to the already airborne formation of 306th BG B-17s enroute to Merseburg. Approximately 30 minutes from Merseburg trouble developed in one of the four Duration Plus engines. Co-pilot Lieutenant (Lt) Gerald Johnson tried to correct the problem, but the engine eventually had to be shut down. In B-17 flying formation at 29,500 feet and entering the target zone, a second Duration Plus engine started to run rough. Then at the Initial Point (IP) where the bombers began the bomb run on the target, the B-17 was hit by shrapnel that penetrated the upper right aluminum shell of the aircraft nose. A fire was spontaneously ignited as the oxygen and oil lines were severed. Flames burst into the cockpit next to the co-pilot. Lt Nattier gave the order to bail out. Lt Johnson left the cockpit and proceeded to the front nose escape hatch to join navigator Lt Bernard Weinstein and bombardier Lt William Gregory according to bail out procedure. Lt Nattier maneuvered Duration Plus out of the flying formation and put the plane into a steep dive from 29,500 feet. At a lower altitude oxygen was more readily available to the crew, and the chance of a successful bail out was improved. Then he too left the cockpit and moved toward the front escape hatch. Clayton did not expect to have to return to the cockpit again before he too could bail out. As Lt Nattier approached the front escape hatch he saw that the co-pilot, navigator, and bombardier had not left the aircraft. Above the noise he motioned them “Out,” but Lt Weinstein mouthed “No.” Clayton did not know what the problem was but knew he had to go back to the cockpit to change the angle of the B-17 dive to allow more time for them to bail out. Clayton assumed the ball turret gunner, waist gunner, tail gunner, and radio operator had already bailed out through a rear escape hatch. [They had.] The top turret gunner Sergeant (Sgt) Gerald Bump was still on the B-17 and had made valiant attempts to put out the fire. When Clayton got to the cockpit it was almost engulfed in flames. The instrument panel was melting. He had to reach through the flames to adjust the controls to decrease the B-17 dive angle. His face, neck, and both hands were badly burned. The route to the front escape hatch was now blocked with fire and smoke. Lt Nattier’s and Sgt Bump’s only escape route was to jump through the bomb bay. The bombs had not been dropped that day. Clayton jumped after Sgt Bump, but his parachute strap caught on the arming propeller of one of the bombs. He pulled it loose and fell out of the aircraft. By then he was semiconscious. Clayton later estimated that from the time the shrapnel hit the B-17 until he bailed out was approximately five minutes. An American P-51 Mustang fighter plane in the area piloted by Lt William McKee, III, followed the B-17 until it crashed and exploded. The co-pilot, navigator, and bombardier had not bailed out and were killed in action. Lt Nattier and Sgt Bump landed in a field near Halle, Germany. Sgt Bump injured his ankle. Lt Nattier was seriously burned and semiconscious. Cadets from a local Luftwaffe Flight School found them and transported the two airmen to the Halle jail where a medic from the school treated them. Clayton does remember temporarily regaining consciousness a couple of times on the way to the Halle jail. He opened his eyes once and found himself looking into the eyes of a donkey. It seems he was thrown over the back of the animal, transferred to a small automobile (in later life he realized the car had been an early model Volkswagen), and then taken to the jail. Lt Nattier and Sgt Bump began their journey from Halle to a prisoner of war (POW) camp. Lt Nattier was first taken to a Dulug Luft near Frankfurt, Germany, where he was interrogated. [A Dulag Luft was a transit and interrogation center for newly captured Allied airmen. After interrogation the prisoners were sent to permanent POW camps.] When being transported from Frankfurt to his permanent camp, he saw his five surviving crew members at the Frankfurt train station. They were sent to Stalag Luft 4* at Gross Tychow, Pomerania (now Tychowo, Poland). Clayton arrived at Stalag Luft 1 (SL1) near Barth, Western Pomerania, Germany, on the Baltic Sea. His bandages had not been changed since September 13, but miraculously he had not developed an infection at the burn sites. He spent his first three weeks in the camp hospital. Lt Nattier became SL1 POW 5577. His camp mailing address was Clayton Nattier, North Compound 2, Kriegsgefangene Baracke 202, Room 6, Stalag Luft #1, Barth, Germany. Each room held 18 prisoners with bunk beds stacked three high. A small wood burning stove provided them limited heat and a place to cook their meals. Food provided by the Germans was supplemented with Red Cross packages. Delivery of Red Cross packages to SL1 stopped from December 26, 1944 – March 28, 1945. Packages were known to be in Sweden and on the docks in Germany but were not delivered. Clayton describes a three month period without the supplemental food supply as one of near starvation the POWs endured. Colonel (Col) Hubert “Hub” Zemke became POW 6559 at SL1. He was captured after his P-51 Mustang experienced a structural failure over Germany. His rank made him Senior Allied Officer at the camp. He was 30 years old. Col Zemke was the son of German immigrants and spoke fluent German. The Col had delivered American P-40 Warhawk fighter aircraft to Russia as part of the United States (US) Lend-Lease Act, and he taught the Russians how to fly and maintain the aircraft. His language skills and experience with the Russian military would prove extremely useful. Clayton still speaks highly of Col Zemke and his leadership ability which greatly improved POW conditions. The Russians liberated SL1. There were nearly 9,000 POWs in the camp at that time. The Russians planned to transport the POWs to Odessa, Russia, on the Black Sea. Col Zemke along with other Allied leaders had a different plan. The plan called Operation Revival (May 12 – May 14, 1945) was to fly SL1 POWs out of hostile-held territory and back behind Allied lines. B-17s from the US 91st BG based at Bassingbourn, England, flew into what was a German military airfield near Barth. American POWs were then flown to Camp Lucky Strike (one of the US camps in France for repatriated servicemen) near LeHavre. British POWs and those POWs sick or injured were flown to England. Nine days after SL1 was liberated by the Russians, Clayton wrote a letter to his parents. These past few days have been quite eventful to say the least. The “rotten Huns” left us on the thirtieth of April, and the Russians came in the following day. Although we can’t go just anywhere in Germany we are free outside these barbed wire fences, a wonderful feeling. I’d like to tell you that I’ll be home in a few days but that probably wouldn’t be true. I can’t begin to tell you how anxious I am to get home, and it won’t be long I know –- a very conservative estimate would be the first of July and barely possible by July tenth. Got three letters here – one from Mother, Dad, and Jean. Boy what a privilege it is to write a letter in ink that won’t be censored by some German. Russians have been bringing in cattle and hogs to butcher. Yesterday we cooked our first fresh meat since England. I’m in as good health as I ever was and feel swell – I just want to get home. Drop Jean a note and tell her I’ll see her soon. Strawberry season should be in full swing when I get home – I can see your strawberry shortcake now Mother. Clayton would eventually sail from LeHavre on a Liberty ship back to the US. He would return home to Concordia, Kansas, and propose to “a pretty special girl” named Jean Mails (mentioned in his letter). Jean and Clayton got married two weeks after his return. Then as Clayton says he got started with the rest of his life. *In January and February 1945, as the Soviet Army was advancing west, the Germans began marching POWs further into Germany from Stalag Luft 4 (SL4) and other Allied POW camps. The march for the SL4 POWs spanned over 80 days and an estimated 600 miles (965 kilometers). They first were marched west. Then they were marched east when Allied artillery fire could be heard to the west. On May 2, 1945, the SL4 POWs were liberated by a British unit. Clayton’s five surviving crew members — Gerald Bump, Edwin Block, Max Kimmel, Cecil Richardson, and Richard Edwards — returned to the US after SL4 was liberated. They all kept in touch after the war. A special thank you to Clayton Nattier for sharing his wartime experiences with me and answering my many questions. Clayton’s son-in-law, Thom Mindala, wrote a book Flying the B-17 Flying Fortress which details Clayton’s wartime experiences. The story and photographs are posted with Clayton’s and his family’s permission. Thank you to WWII 306th BG Historical Association Historian Cliff Deets who is an invaluable resource for BG history. Information about the WWII 306th BG can be found at http://306bg.us.